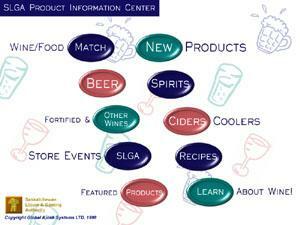 The SLGA Product Information Center is a new innovative approach to deliver customer service and product information. The Product Information Center is a touch-screen kiosk based on the NCR 7401 platform. The information is sensory pleasing through well designed graphics, full-motion video clips and audio prompts. The Product Information Center helps customers experience a higher level of independence and confidence in selecting products and services. The Product Information Center will enable the customer to have instant electronic access to information under ten categories: complementary wines to any meal, new products, beer products, spirits, recipes, refreshment beverages, fortified and miscellaneous wines, featured products, store activities, and liquor and gaming services. The software uses all of the capacities of the NCR 7401,including the built in scanner for UPC reading for instant access to information in the database. The customer can also obtain a paper copy of the information from the Center. Click here to take a tour of SLGA Wine Application. NCR 7401 Self Service Kiosk Wine n Dine Interactive is a wine and dining information centre that takes an innovative new approach to delivering customer service and product information. Based on the NCR 7401 self-service platform, Wine n Dine Interactive comes complete with eye-grabbing graphics, full-motion video clips and audio prompts that provide your customers with sensory-pleasing information  at the simple touch of a button. And best of all because Wine n Dine Interactive is so user-friendly, your customer can scan quickly become confident in using the self-service kiosk to select the products and services that best meet their needs. Wine n Dine Interactive can also be used as an effective marketing tool to consistently deliver valuable product and service information to wine and liquor distributors. In addition, advertising opportunities on targeted products are available throughout the menu system. Click here to take a tour of LCBO Wine Application. Pictures from 2 Cooper Street in Toronto.